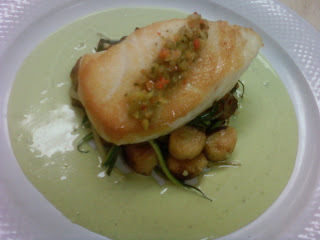 This special ran about a month ago; seared Grouper over carmalized salsify, horseradish gnocchi and shoestring zucchini in a basil pest cream topped with pickeled summer peppers. 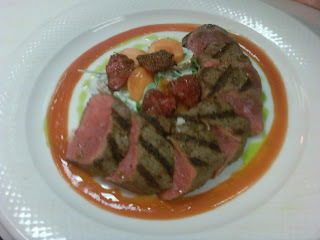 This is the current weeks meat special; Grilled boneless lamb loin over a warm watercress-fingerling potato salad in a feta-oregano dressing garnished with persimmons and oven-dried strawberries finished with a tomato reduction, herb oil and sea salt. This might well be the 'wordiest' description of a dish ever. These pictures where taken with my phone's camera. I never expected them to come out this well. They aren't super crisp or detailed, but they convey the essence of the dish nicely and when your working the line and trying to catch a shot of a dish in 10 seconds while the server is giving you the evil eye because 10 seconds feels like 5 minutes. Then, in the flow of things it is much easier to grab the phone and snap two shots and move on. I plan on trying this more often while my camera is on vacation. wow, these look delicious. I wish more restaurants featured lamb. I think we're going to give Nemo Grille another try. We went a few years ago (before you worked there) and thought it was overpriced for what we got. How much were these specials? Thanks livetocook. Lamb is a touchy product around town. It does well as a special, but doesn't sell consistant when on the menu. I was suprised as to how well this special in particular sold. I set the price of the lamb at 26$. I can see how you felt Nemo to be overpriced if you visit alot of other indie restaurants around Cleveland/Tremont/E. 4th. In Avon we cater to alot of simple meat and potato type of clientle. What I can say about the product you get at Nemo is that it is top notch. You get what you order and you are charged appropriatly for a sizeable portion. Without saying anything bad about any other places around town...Nemo delivers fresh quality ingrediants across the board and that is one of the main reasons I've come back to work there. When you decide to come out let me know and I can give you a heads up on specials and the such. Same with lamb here. I keep it on the menu because a couple of big shot regulars cry when I threaten to remove it. I keep my camera on a tri-pod in the corner, I have a spot where the lighting is best and the servers know when I say photo op they automatically put the dish in the "sweet spot" I grab the camera and we usually get it done in about 15 secs. I hear you back about the lamb. It's hard to justify taking one of the pricest items off the menu, but you can only manage your inventory so well untill the 6 you sold last month don't cover the 2 you lost. I understnd the tri-pod trick. My boss, the owner has his camera on a tri-pod in the corner. He is currently running it on camera to post on the new Nemo Grille Facebook page. Anyhow, I never meant for the pics on the blog to be perfect. Just like most of what I write about in the kitchen they are quick, fuzzy, but truthfull renditions of what I really see. Thanks for the comment Salty, Happy Holidays my friend! I just signed up for the email list. Thanks for the suggestion. Top Chef Vegas, over and out.